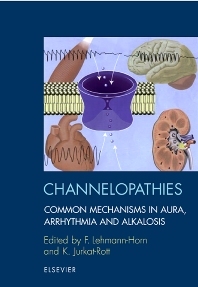 This book describes human hereditary ion channel diseases of voltage- and ligand-gated ion channels covering the diverse fields of medicine myology, neurology, cardiology, and nephrology requiring a wide and interdisciplinary readership. Interesting parallels in pathogenetic mechanisms of disease are especially emphasized to interest even highly specialized readers in entities outside of their fields. Each author has written an objective overview of his or her particular subject in a way that should allow the reader within a short period of time to obtain a comprehensive picture of the present state of art. Preface (F. Lehmann-Horn and K. Jurkat-Rott). Introduction. Muscle diseases. Sodium and calcium channelopathies of sarcolemma: periodic paralyses, paramyotonia congenita and potassium-aggravated myotonia (N. Mitrovic and H. Lerche). 2. Muscle chloride channelopathies: myotonia congenita (R. Ruédel). Molecular aspects of malignant hyperthermia and central core disease (P.J. Lynch and T.V. McCarthy). Mutations affecting muscle nicotinic acetylcholine receptors and their role in congenital myasthenic syndromes (D. Beeson and J. Newsom-Davis). Ion channel defects in primary electrical diseases of the heart (G.E. Kirsch). Neuronal diseases. Migraine and ataxias (A. Ducros, C. Denier and E. Tournier-Lasserve). Genetic analysis of idiopathic epilepsies: the role of ion channel muta- tions (O.K. Steinlein). The inhibitory glycine receptor as a model of hereditary channelopathies (K. Becker, C.-M. Becker and H.-G. Breitinger). Dent's disease: an hereditary nephrolithiasis caused by dysfunction of a voltage-gated chloride channel (C. Fahlke). Liddle's syndrome and pseudohypoaldosteronism type I (S. Gruénder). The role of ATP-sensitive K+ channels in familial hyperinsulinism (B. Glaser and L. Aguilar-Bryan). 13. Hereditary hypokalemic salt-losing tubulopathies (N. Jeck, M. Conrad and H.W. Seyberth). Appendix. Index.